If you’ve been reading along, you’ll know already that almost every area in my life is riddled with guilt – or potential guilt. Well, Halloween is no exception. 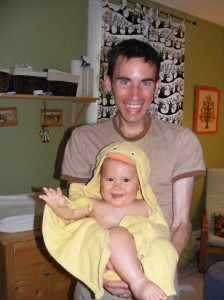 In this case, it is my bizarre idea that if I don’t make Owen’s costume myself, I will have failed as a mother. My mother always made our costumes (though sometimes we went as gypsies in oversized skirts and tops, with a dollop of lipstick). Also, I am not a particularly clever sewer, so I have to make something really creative without resorting to a pattern. And because I am likely to make something vaguely makeshift, I should really spend as little money as possible. Luckily, one of the most amusing recent trends (to me) is to upcycle — take scraps and turn them into treasures. This satisfies the environmentally conscious (recycling and reusing in one! No added pressure on the planet!) and the inherently cheap. Scraps of fabric may be found in one’s fabric bin, in the fabric store reject bin, at the second hand store … and they cost pennies. I spent $4 and have reams of fabric left over. I had this idea that Owen could be a turtle. I thought I could make a breast plate and a shell out of fabric and an old cushion I had hanging around. I could quilt on the shell pattern. And put Owen in some green and/or brown clothes (and some green makeup maybe) and voila! Instant turtle. Like many of my plans, this one is turning into more work than I was hoping, with less reward. Duncan, my only judge on the project so far, looked at my creation and asked if I could make it look less like Owen was wearing a pillow on his back. I cut open the “shell,” added a book – it still looked like a pillow – just heavier and less comfortable. We went back to the original plan. Now Duncan has suggested painting the quilted pattern so it will look more like a shell. I entirely agree with his suggestion, only unfortunately, it means I’m not finished yet – and I was really hoping to be finished this costume in 2 hours. So I will (next weekend) get out my acrylic paints and try to make shell-like shading on the quilted pillow backpack. This is a lovingly made costume that will be awarded lots of points for trying – but it will never be nice enough to merit a professional photograph. Oh well, at least I will have avoided commercialism this Halloween. That’s a little less guilt for me. I will keep you all updated on my progress and will include pictures once the costume (such as it is) is complete. I’ve been feeling grey lately. Not blue exactly, though I’ve cried more this week than I have in the past 6 months, maybe a year. I’m not exactly sure why, but I can trace parts of my feeling to a general sense of being overwhelmed. My work is wonderful, my students are for the most part lovely, but I haven’t quite managed to get back to the resilient teacher that I have been for the past couple of years. I feel like I am trying so hard that it’s too hard and that somehow all the cracks are obvious. I’ve been missing Owen, too, in the now full-time daycare schedule we have him in. I was craving his cheeks the other night and almost wanted to wake him up just to feel them. I was at a meeting that night and got home when he was already asleep. I am worried (this week) that I am trying to do too much at once. That I can’t slow down to enjoy the little moments of colour that pop into life. I am worried that, to quote Dave Matthews’ Grey Street, “all the colours mix together to grey.” And when it’s grey like that, it’s foggy and dreary (inside my head). I was berating myself at dinner the other night because I haven’t read enough Greek literature. I should read the Odyssey. I really should. But I probably don’t need to read it this week. I should probably read Dante’s Inferno. Also a good idea. Also a big hole in the education of someone who teaches literature. And then I should probably reread Paradise Lost and some Shakespeare and all those Victorian novels whose plots are growing hazy. And Ulysses. And when I get like this I feel frantic and I start reading bits and pieces of things, trying to squeeze it all into the 5 minutes before I fall asleep. It’s like trying to catch up on e-mail or marking when I am also playing Lego with Owen. Why can’t I just play Lego? Why do I have to try to do something else also? Why can’t I just relax? That’s what I always tell Owen. Chill Chill Chill, Relax Relax. When I am like this I grow insecure, fragile. And I know, intellectually, that I’m probably not perceived as a fool by most people, but I feel exposed, like everyone can see everything I am trying to hide. All this is probably too much to say here, but that’s how I have been feeling this week. I do feel better today. I am glad that tomorrow is Saturday and there is nowhere to rush to. I am going to try to stop and breathe a little, try to focus on the small flashes of colour that, after all, make up our lives. 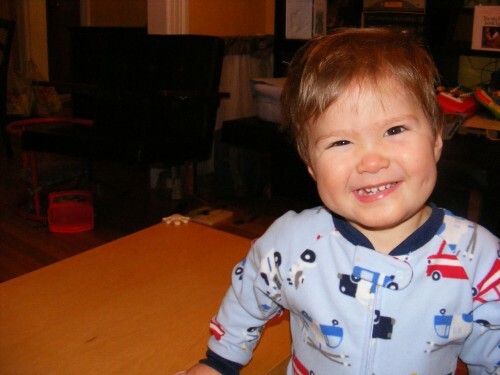 …when the whole wide world is fast asleep (except Owen), Duncan and I cringe and groan. Since we returned from our trip to Nova Scotia (about a month ago now), Owen’s sleep habits have shifted. He’s still a fairly reliable sleeper, but has developed some attachment issues that have meant that he is now only going to sleep if we give him a bottle right before bed (which means he’s not brushing his teeth). In addition, there have been several mornings this week that he has awakened at 4:30, 4:20, 4:10. I know some mothers who will get up with their babies, give them breakfast, and play with them. But I just can’t. I can muster some very forced enthusiasm at 5:30, but in the wee small hours, I just want to be asleep, eyes closed, cuddled in downy duvet and pillows, relaxed, warm. Asleep. You know? The past two mornings, Duncan (bless his running legs and aerobicized heart) has taken Owen out on his early morning run, so I’ve been able to sleep in until 6:15 or so — pretty blissful for a work day. This morning, however, it was definitely my turn when Owen was heard making little squawks from his bed. A bottle in a dark room will usually get him back to sleep at 2:00 or 3:00, but when he wakes up at 4:00, he’s wired for morning. I tried the bottle, slipped him into bed, left the room. He rolled over and cuddled into his quilt (and I felt triumphant!) but by the time I got to the bedroom door, he was crying. So we had a cuddle. And it was one of those wonderful middle-of-the-night cuddles with warm, soft baby skin and soft breathing. I closed my eyes and really did revel in a moment that I know is fleeting. Eventually, I thought I had gotten him into a sleepy enough state to return him to bed but no… his crib was a betrayal! So then I brought him into our bed, and again, we almost had him asleep, but it didn’t work either, and he began kicking and squirming to be free. So, beast that I am, after trying to get him back to bed for an hour, I put him back in his crib, shut both of our doors, and slept. He did cry a little, but it was very short-lived (maybe 3 minutes, and even that wasn’t steady). We all slept till 7:00, which is so much more reasonable for a Saturday morning! Owen’s bedtime is about 7:30 and he wants to be in bed by then. He gets clumsy and sleepy and is almost begging for bed. The other night he even grunted and pointed to his bed. I think that meant he wanted to go to sleep, but who knows. If this persists, we’ll have to think about putting him to bed later, but we’re hoping this trend doesn’t continue. Usually, he when he goes to sleep at 7:30, he wakes up after 6:00 – to as late as 8:00. I’ve heard from other mothers that they cherish the midnight, 2:00 am, 4:00 am cuddles. Last night/this morning I got a glimpse of why, but I still vastly prefer sleeping to cuddles with sleepy babies (who are not quite sleepy enough) in the wee small hours. This seems like a selfish admission, but I feel somehow that for all the mothers who are wired to love to nurture their babies in the middle of the night, there must be others of us who would rather not see or think about their babies until 7:00 am, unless of course in the middle of a sweet sleepy dream. Idle Parenting Means Happy Children. I grew up with a healthy amount of neglect. My mother, at her wit’s end, would often yell “Go play outside!” And we would grumble and head out wondering why mothers didn’t have to play outside too? But then of course we would discover something – a ring of rose-shaped weeds? A fairy garden! Or we’d build a snow fort. And then we’d forget our griping and come inside only when our fingers were numb and our snowpants wet through. My friend Stephanie’s house bordered a fairly large river and we played IN the river on a fairly regular basis. Most of the time, we just skipped from rock to rock (once we did this in Parisian party dresses). We got in trouble, but we thought it must have been because we were wearing our party dresses, so the next time, we changed into ballet leotards (which is exactly like a bathing suit, perfect for rivers!). This time we waded to an island in the middle of the river, up to our armpits in fairly fast-moving water, losing our footing occasionally. We were genuinely shocked when we got in trouble again. Another time we decided to walk from her house to my house, through the woods. We hadn’t planned it, but we were playing in the forest and got so far in that we figured it was closer to go to my house than to hers. Our houses were 2-3 km apart. And again, we got in trouble! We were so surprised. I think we expected the accolades of explorers discovering a new continent. That our parents punished us for these escapades I guess indicates that we weren’t supposed to play in the river or hike through the woods without telling anyone. But that we did, fairly often, means that we were left to our own devices, and that no one missed us for hours at a time. These memories of play remain, when the memory of punishment has faded. Duncan has similar memories of childhood freedom: exploring World War I forts near his home in Halifax, tobogganing and almost falling into the harbour, or playing with a real hammer and whacking his thumb. We want to allow Owen to have these kinds of memories, and I’m curious to know what my response will be when he’s old enough to understand the concept of danger. I’d like to think I’ll allow him a good deal of freedom. My lazy side is going to have to do battle with my anxious side. I’m just afraid my anxious side will win. Author AnnaPosted on July 22, 2010 July 30, 2010 Categories Parenting/PregnancyTags adventure, family, guilt, idle parenting3 Comments on Idle Parenting? I’ve spent the week cleaning, sorting, getting rid of, boxing, trashing, sweating, drooping, reviving. I don’t know why I got this bee in my bonnet, but I think it might have something to do with the guilt of having Owen in daycare full time while I have no real work in the summer, so I had to create a job in order to feel like my days were meaningful. This morning as I backed out of the driveway at 8:30 to take Owen to daycare, my neighbour and her mother were on the front porch. And in my head they were judging me for taking him to daycare and then coming home. They don’t know how busy I am going to be today! I thought to myself. I am not just going to sit around and watch tv or update my blog. OK – they don’t know about the blog, but anyway. This week, I organized the bathroom drawers, my underwear drawer, my wrapping supplies, the winter scarves. I ironed napkins. I hung pictures, dusted shelves, vaccuumed and mopped under the couch. I threw away expired cold medication, vitamins, and a pregnancy test (no one wants to risk that emotional roller coaster… you’re pregnant – oops, no – the test expired in July 2010 – OR – You’re not pregnant and you go drink half a bottle of wine – except you are because the test expired in July 2010). 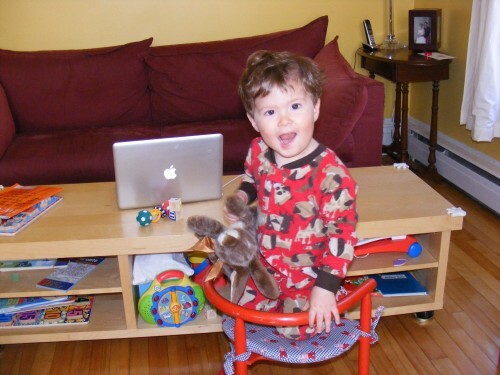 I have spent so much time justifying to people why daycare is so awesome – and it is – when I’m working. But right now, I am kind of craving a daycare vacation. Fortunately, in a little over a week, we’ll be off to Nova Scotia and free of schedules and at least that kind of guilt. Does anyone feel guilty about leaving their child with his grandparents? Surely not! What I have done this week is the nesting that was supposed to happen in the third trimester of my pregnancy. A nesting phase that I tried to force. Well, here it is – in response to daycare, not impending childbirth. It got so bad that earlier this week I was cleaning up Owen’s play area while he was still playing. I think I took his train out of his hand to tidy it up. Duncan is afraid he will end up in a box in the basement, tidied away. I’ve finished the house and am now itching to go get Owen, but he’s still napping. Soon I will kiss those scrumptious cheeks (after I’ve scrubbed them and rearranged his hair). I was at a party on Saturday night with a whole bunch of childless people. I don’t know if they want kids or not, but there seemed to be a lot of apprehension over losing your entire life if you happen to be caught in the black hole of parenthood. (The unknown can be a scary place for a grown-up*). One question that came up (as it so often does) is whether I like being back at work. The answer: an unqualified YES. This answer shocks people. Really? But you must have a good daycare. Yes, I do. But don’t you miss him? Not really… I don’t. I don’t miss him when he’s napping or down for the night, either. I don’t miss him when Duncan takes him out for a run. I feel weird about this, because it seems to be taboo to admit that you don’t pine for your baby when you’re away from him. I look forward to seeing him, but I don’t think that’s the same thing. I went back to work when Owen was 7 months old. Was I ready any earlier? Absolutely not. Was it difficult at times? Of course. But overwhelmingly, my return to work was a relief. It was a return to the person I was before I had Owen, a person I had, quite frankly, missed. I enjoyed teaching, reading, talking to students and colleagues, and I also enjoyed picking Owen up from daycare at the end of the day for a jaunt to the park or a walk or an hour of playtime before dinner. At my staff party last week, a couple of my colleagues admitted that they’d felt the same way. Another friend of mine has always insisted that she is not cut out to be a stay-at-home mother. And of course I know others who love spending every day with their kids. For me, though, daycare has been miraculous. I still want to clarify that I love having a child and that I am not racing to be away from him every day. Owen is a giggling, squishy bundle of sunshine who radiates joy onto his surroundings. I think I could spend every single day with him (and never crave daycare’s breaks) if I had another adult around all the time. Part of what I found difficult in the early days with Owen was the profound isolation I felt. The good days were always the days I’d had coffee with a friend, or lunch with family. The difficult days were the days I spent alone with Owen. Some days I would go to the drugstore just to have a conversation with a grown-up. It didn’t even matter if Owen was having a good day or a bad day. It was just the long lonely stretch of having only a baby to talk to. It’s not the baby. It’s the loneliness – it’s free time that you can’t occupy with any of the normal things you do to relieve boredom. Owen is at daycare as I write this. He happily waved goodbye when I left… because I think he knew he would see me soon.